The following appears in the May 2018 issue of Recording Magazine and is written by Darwin Grosse. In our discussion of the recording process, so far we’ve focused on only part of the sonic world: sounds that are represented by air pressure waves, captured with microphones. Many modern musical styles feature sounds that may have never existed as acoustic signals until they hit your monitor speakers. This month, we’ll cover recording electric and electronic instruments, making sure that we maximize their signal quality, and look at some ways of enhancing their sound post-recording. Before we walk about the instruments themselves, we need to talk about signal levels and our need to create a match between systems. When we talked about microphones, we talked about them generating a very low-level signal, and the need to use a preamp to increase the gain to “usable” line levels. But what level is usable? The answer depends on the destination. In most cases, we can get a hint about the expected level by the connector that devices use: -10 gear tends to use unbalanced (two-conductor) RCA connections, while +4 gear often uses balanced (three-conductor) XLR or 1/4″ connectors. The difference in level is significant; it means that you need to take notice when connecting devices that use different line levels, so that the source doesn’t overload the destination or be too soft and noisy. These two standards inform us of a standard voltage level that an amplifier needs to produce to get a microphone, instrument or other equipment to be a voltage-volume match. Since we will be boosting lower-level signals, we’ll need an amplifier of some sort. Most amplifiers that take a signal to line level are called “preamplifiers” to distinguish them from speaker-driving power amplifiers. A mic preamp takes the very low signal from a microphone and pushed it to line level; and instrument preamp boosts a signal before it reaches a power amp, while sometimes changing its tone. Electric instruments like guitars and basses use a pickup—a long wire coiled around a magnet—to capture the vibration of a metal string and turn it into an electric signal. This can cause problems for the engineer, especially if we decide to record the direct sound of the instrument itself. Electric instrument players are used to playing through amplifiers, so most consider the sound of an amp to be a critical part of their tone, and they may find the sound of a direct connection to an audio interface to be too sterile sounding. Thus, even if you are directly connecting the guitar to your recorder, you will often want to simultaneously mic and record an amplifier. This helps the player feel more at home while giving you more options during mixdown. Bass players, on the other hand, don’t always demand a miked amp; the bass is usually meant to be clean and focused, so playing directly into a mixer or interface for recording is often preferable. 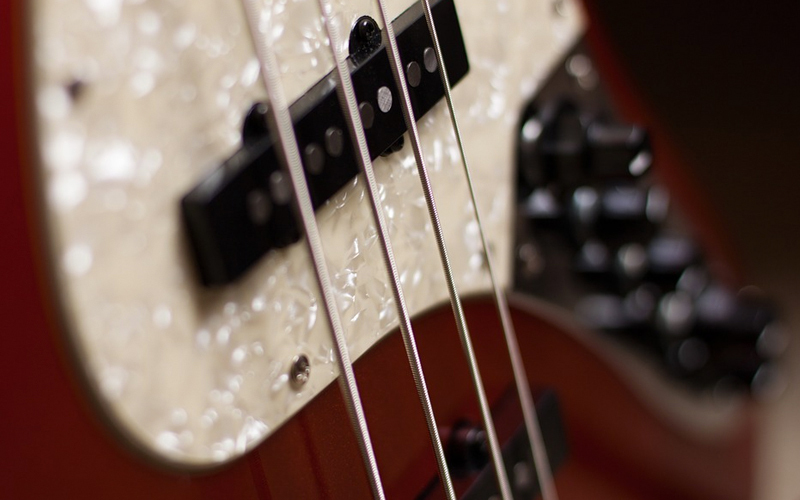 A bass preamp, when it’s used, provides tone control without the headaches of miking an amp. The main problem with direct recording of guitars is a mismatched impedance. Impedance, in very simple terms, is how much a device hampers the flow of signal in or out. As a general rule, you want the input impedance of your destination to be much higher than the output impedance of your source. Guitar pickups have a much higher output impedance than mics, so you can’t run long cables from them or plug them into a mixer without your tone suffering. High-impedance instrument-level signals need to be converted into low-impedance mic-level signals, which is often done with an inline DI (direct inject) box. Some guitar amps have direct preamp outputs that do the same thing, and it’s very common for interfaces to have a dedicated or switchable “Hi-Z” (high-impedance) guitar input. As a rule, look for an impedance at or above 1 million ohms (1 Megohm). Why not just use a mic? If the miked amp sounds good, why bother with a direct signal at all? For reasons of flexibility. Over the past few years, improvements in computer-based amp and speaker modeling, guitar effects, and room simulation make it possible to dial in fantastic sounds… but you have to start with a clean signal, not what’s coming out of an amp. The miked amp may be a great sound, but it’s much harder to tweak after the fact. Basses can also benefit from a clear articulate direct sound mixed with a rounder mike-amp sound. If you are really a tone purist, you may find that virtual amps just don’t do it for you. If you have a direct signal recorded, there’s another super-flexible option: reamping. A reamplification box takes a clean recorded guitar signal and “reverses” the DI process, turning it into a high-impedance tone that can be fed into an amp after the face. This gives you lots of flexibility to change or augment your tone with miked amps before mixdown. The Radial X-Amp REAMP box. Read our full reamping guide here. 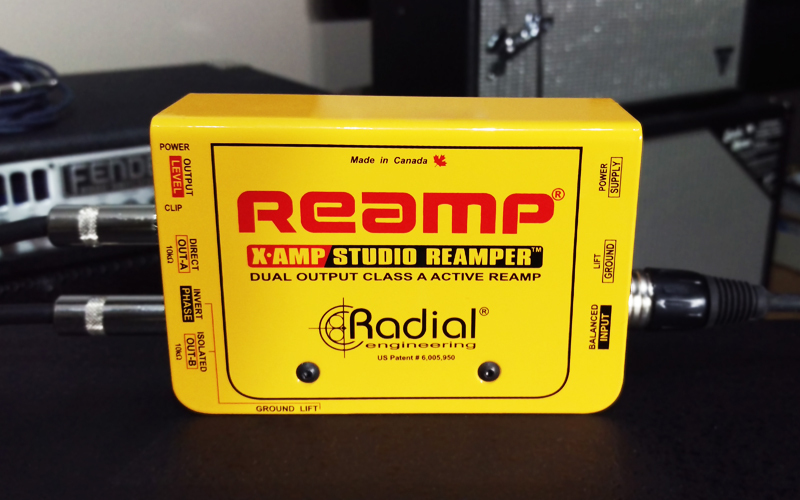 The REAMP brand name belongs to Radial Engineering, who purchased the REAMP patents and trademarks from REAMP founder John Cuniberti with his blessing. Other companies make devices that perform reamplification as well, and some audio interfaces like the Arturia AudioFuse even have built-in reamping outputs. For more on Recording Magazine. For more on Radial Engineering.